Russia's $163 million Phobos-Grunt Mars probe, stranded in low-Earth orbit after a malfunction following launch Nov. 8, is expected to fall back into Earth's atmosphere next month, Russian officials confirmed Friday. The massive spacecraft, still loaded with 11 tons of rocket fuel, will burn up during entry, but 20 to 30 pieces of debris, totaling several hundred pounds, are expected to survive atmospheric heating, hitting the ground somewhere between 51.5 degrees to either side of the equator. The spacecraft is stranded in an 89.2-minute orbit with a low point, or perigee, of 125 miles and a high point, or apogee, of 171 miles. The Russian space agency Roscosmos said re-entry is expected between Jan. 6 and 19. Ted Molczan, a respected independent satellite tracking expert, calculates entry will occur around Jan. 11, plus or minus 5 days. Whenever it falls, this will be the third uncontrolled re-entry of a large satellite since September. NASA's 6.3-ton Upper Atmosphere Research Satellite fell back to Earth late Sept. 23 U.S. time, showering debris harmlessly into the south Pacific Ocean, and wreckage from Germany's 1.7-ton ROSAT X-ray telescope fell without incident into the Bay of Bengal on Oct. 23. Russian space officials are hoping Phobos-Grunt follows suit, with any debris impacting in unpopulated areas, but accurate predictions will not be possible until a few days, or even hours, before re-entry. Roscosmos and the Russian defense ministry have set up a task force to monitor Phobos-Grunt's trajectory and eventual fall to Earth. In a statement, Roscosmos, the Russian federal space agency, said the spacecraft's propellant -- highly toxic nitrogen tetroxide and dimethylhydrazine rocket fuel -- will burn up in the atmosphere and poses no threat to the public. Likewise, the agency said that 10 micrograms of radioactive Cobalt-57, used in one of the spacecraft's experiments, would not pose a health threat or have any adverse environmental threat. Perched atop a two-stage Zenit-2 rocket, Phobos-Grunt was launched Nov. 8 from the Baikonur Cosmodrome in Kazakhstan. It successfully reached its preliminary parking orbit, but the spacecraft's main propulsion module, or MDU, did not ignite as expected for the first of two "burns" to boost the craft onto an interplanetary trajectory to Mars. The probe's solar arrays apparently deployed as planned, indicating the spacecraft had power and was not limited to on-board batteries. Amateur satellite trackers said Phobos-Grunt appeared to be steady and not flashing as one would expect if it was tumbling. But a throw-away fuel tank that normally would have been jettisoned after the initial Earth-departure rocket firing apparently remained in place, possibly blocking a critical low-gain antenna. Engineers made multiple attempts to communicate with the spacecraft during passes over Russian ground stations, sending commands to initiate contact and perhaps to reboot the flight computer. European Space Agency ground stations also were used to "listen" for telemetry in hopes of establishing communications. On Nov. 21, the launch window for a normal trajectory to Mars closed, ending any chance for the planned mission even if the spacecraft could be recovered. The next night, an ESA ground station in Perth, Australia, finally heard signals from Phobos-Grunt, according to Anatoly Zak's RussianSpaceWeb, but it's not clear whether any meaningful data was received then or during a handful of subsequent contacts. 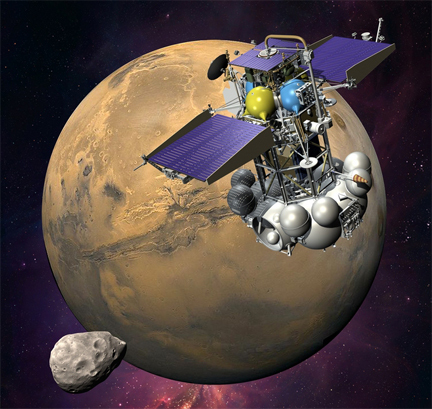 Phobos-Grunt was the first interplanetary spacecraft launched by Russia since 1996 when an ambitious Mars mission was lost in a launch failure. 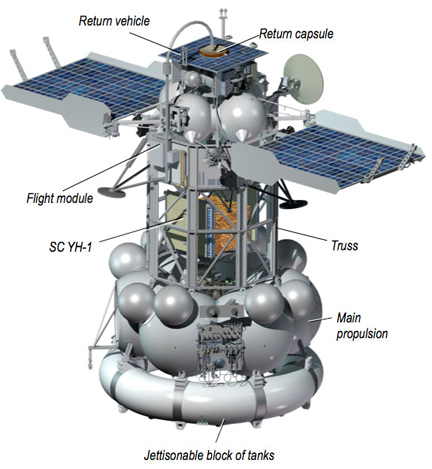 Of the 19 unmanned Russian Mars missions launched prior to Phobos-Grunt, 15 were outright failures. NASA's record currently stands at 13 successes in 18 previous missions, not counting the $2.5 billion Mars Science Laboratory, which was launched toward the red planet Nov. 26. Phobos-Grunt was expected to reach Mars in October 2012. The flight plan called for the spacecraft to jettison its propulsion module, used for trajectory correction maneuvers and to brake into orbit, and release a small Chinese orbiter. In early 2013, the Russian mother craft was to maneuver itself to a precisely orchestrated landing on Phobos, one of two small martian moons. A half-pound of soil -- "grunt" in Russian -- was to be collected and launched back to Earth in 2014 for detailed laboratory analysis.